We’d love your help. Let us know what’s wrong with this preview of Come from Away by Genevieve Graham. In the fall of 1939, Grace Baker’s three brothers, sharp and proud in their uniforms, board Canadian ships headed for a faraway war. Grace stays behind, tending to the homefront and the general store that helps keep her small Nova Scotian community running. The war, everyone says, will be over before it starts. But three years later, the fighting rages on and rumours swirl In the fall of 1939, Grace Baker’s three brothers, sharp and proud in their uniforms, board Canadian ships headed for a faraway war. Grace stays behind, tending to the homefront and the general store that helps keep her small Nova Scotian community running. The war, everyone says, will be over before it starts. But three years later, the fighting rages on and rumours swirl about “wolf packs” of German U-Boats lurking in the deep waters along the shores of East Jeddore, a stone’s throw from Grace’s window. As the harsh realities of war come closer to home, Grace buries herself in her work at the store. To ask other readers questions about Come from Away, please sign up. I have never read a Genevieve Graham book before and when I was given the opportunity to read this one I was absolutely thrilled! I have always been quite partial to reading books with themes surrounding our Canadian history and with the setting and the different perspective of World War II that was written here was quite the welcome and refreshing read for me. I suspected that I was in for a treat while reading Come From Away and I most definitely was! COME FROM AWAY by GENEVIEVE GRAHAM was an I have never read a Genevieve Graham book before and when I was given the opportunity to read this one I was absolutely thrilled! I have always been quite partial to reading books with themes surrounding our Canadian history and with the setting and the different perspective of World War II that was written here was quite the welcome and refreshing read for me. I suspected that I was in for a treat while reading Come From Away and I most definitely was! COME FROM AWAY by GENEVIEVE GRAHAM was an emotional, heart-warming and interesting Canadian Historical Romance novel that I found quite the fascinating read. The story captured the setting, time period, heartbreak and the difficulties surrounding the war perfectly and with the romance that develops we see a different side to the enemy. GENEVIEVE GRAHAM delivers a well-paced and beautifully written story here with interesting, compelling, and believable characters that I found quite compassionate to read about. The story was told in alternating perspectives between Rudi and Grace and through Rudi’s story we really got a different understanding and look into the war. I really enjoyed the romance between our two main characters, Rudi and Grace. In the end I thought this was a beautiful love story, vividly descriptive and really appreciated reading a part of our Canadian history! Would recommend! Thank you so much to NetGalley, Simon & Schuster Canada and Genevieve Graham for the opportunity to read an advanced copy of this book in exchange for a review. Come From Away is connected to Tides of Honor but can be read as a standalone. It was my first book by Genevieve Graham and I look forward to reading more. In Come From Away the lives of The Baker children are the focus here and we meet our main character Grace Baker. Come From Away is an interesting and engaging story of love and war seen from a different angle with some Canadian history here. The angle and setting were very refreshing and I really enjoyed seeing a different perspective to WWII Come From Away is connected to Tides of Honor but can be read as a standalone. It was my first book by Genevieve Graham and I look forward to reading more. In Come From Away the lives of The Baker children are the focus here and we meet our main character Grace Baker. Come From Away is an interesting and engaging story of love and war seen from a different angle with some Canadian history here. The angle and setting were very refreshing and I really enjoyed seeing a different perspective to WWII set in Canada. I loved the feeling we got from the setting and it really set the tone for the story. Genevieve Graham does a good job weaving romance, war and Canadian history here with more focus on the romance that at times did feel a little melodramatic. She creates strong, likable and interesting characters and I enjoyed the dynamics between them all. I recommend for historical fiction lovers who like some romance to their stories. Thank you NetGalley, Simon & Schuster Canada and Genevieve Graham for a copy to read and review. Thanks to NetGalley for an advanced ebook in exchange for an honest review. As well, thanks to the author for keeping crazed readers(like me) satisfied by her attention and respect to Canadian history. Alrighty, this book will not be published until April 24th, but when I get my hands on a Genevieve Graham book, NOTHING is going to stop me from jumping right in, including all of the other ARCs I have to read that are being published before this one. Yesterday, I had the perfect opportunity-I wa Thanks to NetGalley for an advanced ebook in exchange for an honest review. As well, thanks to the author for keeping crazed readers(like me) satisfied by her attention and respect to Canadian history. Alrighty, this book will not be published until April 24th, but when I get my hands on a Genevieve Graham book, NOTHING is going to stop me from jumping right in, including all of the other ARCs I have to read that are being published before this one. Yesterday, I had the perfect opportunity-I was on a plane flying from Sept Iles to Quebec. By the time we landed, I was 82% completed and I practically leapt from the plane to my next gate so that I could get it finished. One of my first points I would like to make is that GG listens to her readers. After reading her WWI novel, Tides of Honour fans like me were eager to find out how the rest of Audrey and Danny Baker's story was going to play out. As I recall, I had eluded in my review of that book that I was sure the couple would face many trials in the years ahead. In Come From Away we return to the Eastern Shore of Nova Scotia, what Audrey and Danny are faced with is perhaps the greatest challenge as their three grown sons, Norman, Eugene, and Harry are among the thousands of Canadian men that donned the uniform to fight in WWII. They must help their daughter, Grace, who desires to make as meaningful an effort as that of her brothers. I so loved Danny's relationship with his daughter. It certainly reminded me of my own Dad. Like Grace, I am a sister to a brother and the thought of him or my two nephews going off to war. Well, I just couldn't bear that! Genevieve Graham intricately weaves the story of the heartaches of the Baker family and gives readers a glimmer into the families of the time period, especially parents like Danny and Audrey, who had already seen the horrors and effects of what war could do to soldiers and civilians. While Grace Baker is our female protagonist in Come From Away, it is the mysterious Rudi that will no doubt intrigue readers as much as Grace. A tight lipped trapper, Grace cannot help but feel drawn to Rudi. But from their few brief encounters, Rudi's secretive nature is not altogether welcome- especially during wartime. Finally, this book is just AH-AMAZING and it's steeped in both history and storytelling(I shall just leave you hanging on that score). Come From Away is the perfect answer to that next rainy day or plane trip. Come from Away was nice to see - I always like books being published that are set here in this beautiful province I call home. I ended up buying it about a month ago but it took awhile to actually start reading it. It's a deep and engaging WWII era story reminiscent of films such as the 1980's The Bay Boy, and the Canadian culture really gives it its own atmosphere. Best of all are the characters, who are trying to cope in uncertain times as the whole world did in the 1930's. Caught between the Great Depression and the knowledge of the horrors taking place overseas, main character Grace deals with her brothers' deployment overseas by seeking solace in a quaint little general store. Come From Away is a poignant beautifully written story about a couple that meet under the worst of circumstances and because of it, their lives and those they know and love, will never be the same again. Set in Canada during WWII, this story doesn't hold anything back about not only what families went through with their loved ones off at war but what those brave and strong men went through as well, from both sides of the line. Set in a time when prejudices ran rampant, this story not only takes o Come From Away is a poignant beautifully written story about a couple that meet under the worst of circumstances and because of it, their lives and those they know and love, will never be the same again. Set in a time when prejudices ran rampant, this story not only takes on the difficult topi of having compassion for our enemies but forgiveness as well. Wonderfully done and said, this is a story that you aren't likely to forget anytime soon. In 1939, Grace Baker waves three brothers off to war from the Baker home in East Jeddore, Nova Scotia. She is the one left behind to keep the home fires burning with her parents while working her little fishing village's store. Then she meets a mysterious stranger who sparks her interest only... he's the enemy right? This was a powerful follow up standalone story to Tides of Honour, the story of Grace's parents. It is Canadian Historical Wartime Romance told by a Canadian author. Can a woman lear In 1939, Grace Baker waves three brothers off to war from the Baker home in East Jeddore, Nova Scotia. She is the one left behind to keep the home fires burning with her parents while working her little fishing village's store. Then she meets a mysterious stranger who sparks her interest only... he's the enemy right? Can a woman learn to see the man before her as a person and not a monster? Everyone has lost someone in the war and propaganda embellishes what is already hard truths so Grace and Rudi had amazingly high barriers to scale particularly when Rudi had to lie at first as a matter of survival. The story he eventually tells is sad. So many young men were fed to the Nazi war machine whether they wanted to be there or not. Rudi sees his being stranded on the Nova Scotia coast after his sub was destroyed and then having to survive with only the clothes on his back in the harsh winters and early spring as his chance to escape all that. He is very taken with Grace and she, with him until the truth starts to come out. It was a lot to overcome and I was glad the author didn't write an easy breezy acceptance of Rudi from Grace or her family because it would have rang false. Beyond Grace and Rudi's story, there are the storylines of the whole Baker family as they adjust to a brother and son not coming home and another coming home ravaged by war and never to be the same. The family story was heartwarming and I loved seeing them all there for each other no matter what. Michelle Ferguson was a new to me narrator. She had a lovely, gentle way of letting the story stand on its own merits. She gave the voices and telling in a way that allowed the soul of this story to shine. She had accents, genders, and tones that matched what was needed. I look forward to more of her work. This story dug deep into my emotions and tears did come, but also joy and laughter. Historical romance lovers who want authentic historical backdrop, well-developed characters and storylines should reach for this one. Falling for the enemy is the haunting theme of this WWII Era Canadian Historical Romance. I've relished the way the author captures historical times and events while eliciting deeply emotional responses from me with each new book. Come From Away is a standalone story, but it is closely-connected to Tides of Honour that tells the story of the previous generation of Bakers. I was ecstatic to see what came of Danny, Audrey, their three orphan boys and new baby. Grace was that baby and now it is her Falling for the enemy is the haunting theme of this WWII Era Canadian Historical Romance. I've relished the way the author captures historical times and events while eliciting deeply emotional responses from me with each new book. Come From Away is a standalone story, but it is closely-connected to Tides of Honour that tells the story of the previous generation of Bakers. I was ecstatic to see what came of Danny, Audrey, their three orphan boys and new baby. Grace was that baby and now it is her story and her brothers. This was a poignant, complex, and gently paced enemies to lovers romance. I was captivated to be back amongst the Baker clan and the Nova Scotia setting. Getting both Rudi and Grace's perspectives and how they came together was probably the most beautiful part of the story. The author created a fascinating and engaging backstory for Rudi that showed a different facet of the war to juxtapose what Grace is used to hearing. Grace must come to see Rudi as human, get past the lies he told to survive, and come to some sort of peace that he is a proud, honorable enemy who fought and killed her own people. Alongside Grace and Rudi's story, the reader is gifted the fantastic and well developed side character lines. A romance for one of her brothers, a loss and grief, and a brother who comes back wounded down to his soul from the horrors of war, and, of course to see a middle-aged Danny and Audrey with their grown children, their own abiding love, and their life all together through the dark days of war. It was gently-paced, but the paces slipped by quickly as the story drew me in and kept me right there. It's coming to the point where I'm convinced I'll love pretty much anything this author publishes. Those who love authentic, but deeply emotional historical romances should definitely give this book a try. I love when new authors find me and think that I will like their books. I am always intrigued because with the internet it’s hard to get a feel for people sometimes so when an author asks me if I would like to review their book or they think it’s something I will like—it always makes me pause. I can honestly say that I give every single book that comes across my desk for review, my full and complete consideration for this reason. Authors, publishers, friends on social media…..I read all the pitch I love when new authors find me and think that I will like their books. I am always intrigued because with the internet it’s hard to get a feel for people sometimes so when an author asks me if I would like to review their book or they think it’s something I will like—it always makes me pause. I can honestly say that I give every single book that comes across my desk for review, my full and complete consideration for this reason. Authors, publishers, friends on social media…..I read all the pitches. Now that doesn’t mean that I review them all, but if it truly is something I’m interested in reading and I have time then I’m usually in. That’s how I stumbled on to Genevieve Graham. She found me and asked it I would review her book, TIDES OF HONOUR, back in 2015. I was blown away by the subject matter, characters, and the historical period as well as the added Canadian perspective in WWI. I was thrilled when she asked if I would be interested in reading her latest novel, COME FROM AWAY, and I didn’t even hesitate….absolutely! This book is a little different than the first book that I read but her, as it’s set during WWII rather than WWI as the first one I read. However, her ability to write confidently in both periods is astonishing. She adds so much historical detail to her books. She captures the little nuances of the period and I think it brings a lot to the story. I said this about TIDES OF HONOUR and I think it still applies in this book….the uniqueness of having the story set in Canada was brilliant. There are so many war time romances set in England or France but not in Canada. I personally would not think Canada for a war romance and frankly I was curious how that would play out in the story but I was impressed and interested in that angle of the story. The same is still true in this book…..Canada isn’t quite to go to setting for war romances but once again she pulls it off. If you love war time romances then this is the book for you. Not only is the historical detail amazing, but the romance it real, memorable, and sets itself apart. this isn’t Graham’s first rodeo when it comes to romances. She writes the MacDonnells series as well. Now I haven’t read any of the MacDonnell books but judging from the covers (terrible I know) I am going to venture that they are more of the bodice ripper variety. That’s not to discount their quality by any means. On the contrary, when I was reading this book, there was so much sensuality, chemistry, and emotion between Grace and Rudi that I started to wonder if she had more of a romance background. I didn’t know until now that she has written other historical romance novels but I think in this book that ability helped and strengthen the characters romantic plot and made it so much more thrilling. To me this was more of a war romance/melodrama rather than just another run of the mill ‘historical romance’. It had a lot of layers to the story and the characters were more complex and interesting with a believable romance that will give readers the feels. I was incredibly impressed by this book, my only issue with it was the ending felt a smidge rushed but overall I was completely engrossed in the story and the historical period. I think Graham has really hit on a successful period and location that is all but absent from most bookshelves. I love that she takes her love of Canada and historical war fiction and capitalizes on it. I will say that I got this book rather late, but I never for a second worried that I might not finish it by my target review date. I was captivated from the first page and couldn’t put it down. I read it in a matter of days and one afternoon I read more than half in one sitting! I am sad that I didn’t get to read PROMISES TO KEEP yet, lightly different period but still yet another war time romance. I am curious to read this one as well because again, Canadian war romances just aren’t a thing but yet Graham makes them a thing! Loved my first Genevieve Graham book! Full review pending. Genevieve Graham's latest novel, Come From Away, takes us back to the small fishing outport of East Jeddore, Nova Scotia - also the setting for her previous book, Tides of Honour. Tides of Honour was a historical piece set in WW1 featuring Danny and Audrey. I was thrilled to see that Come From Away continues the story of the Baker family with the next generation. It is now 1942 and war is yet again raging. The three Baker sons have headed off to fight, leaving sister Grace at home to help her pa Genevieve Graham's latest novel, Come From Away, takes us back to the small fishing outport of East Jeddore, Nova Scotia - also the setting for her previous book, Tides of Honour. Tides of Honour was a historical piece set in WW1 featuring Danny and Audrey. I was thrilled to see that Come From Away continues the story of the Baker family with the next generation. It is now 1942 and war is yet again raging. The three Baker sons have headed off to fight, leaving sister Grace at home to help her parents and work in the village. Here's the facts - German U-boats (submarines) did in fact patrol along Canada's East Coast - and sunk over 44 Canadian ships, including the SS Caribou, a passenger ferry. But, here's the absolutely fascinating bit - Come From Away is based on a local legend that is very possibly quite true. In 1942, a small group of German soldiers attended a local Christmas dance in East Jeddore. And it is this incident that is the inspiration for Graham's latest novel. What a great premise! Where to start? I love the setting. Having visited this area, I was able to easily visualize the village, the sea, the landscape and the beauty of this part of Canada. Graham captures the tone and timbre of those war years, detailing everyday life, the difficulties and heartbreak that war brings but juxtaposing that with the perseverance, community spirit and strong family ties of these Nova Scotians. But it is the characters and their lives that make the books for me. I loved revisiting - it felt like catching up with old friends. But this book belongs to Grace - and her love story. Could this have really happened? I like to think so. Come From Away is a lovely story. If you enjoy historical fiction with a strong helping of romance, you're going to want to read Genevieve Graham. I reviewed the print edition for RT Magazine and was excited to be able to review the audio edition too. The audio edition of Come From Away is a delight because of the flawless emotion filled performance by Michelle Ferguson. It’s perfectly articulated, she’s got the male and female voices down pat and her German accent while reciting Rudy’s role is amazing. Having read and reviewed the print copy I love both but I have to admit that listening to it gave it just a little bit more. A 6 stars plus for me! Fascinating! Captivating! ‘Come from Away’ is a must read book! Genevieve Graham knew how to capture the daily atmosphere for that period of time and tell us about the reality of the days during the WWII (Second World War). This author is really a talented storyteller and a very descriptive author. Her historic research was well documented and the story told at a smooth pace, which pleased me very much. I soon became captivated from the start until the very end. Her charac A 6 stars plus for me! Fascinating! Captivating! ‘Come from Away’ is a must read book! Genevieve Graham knew how to capture the daily atmosphere for that period of time and tell us about the reality of the days during the WWII (Second World War). This author is really a talented storyteller and a very descriptive author. Her historic research was well documented and the story told at a smooth pace, which pleased me very much. I soon became captivated from the start until the very end. Her characters, Grace, her family and her circle of friends as well as the mysterious Rudi really captured my heart. If you have read 'Tides of Honour' you will probably remember the Baker family! Ms. Graham's story is set in beautiful Nova Scotia, on Canada's east coast. The author gives you vivid images of a small community, during that tormented period. She tells us about the daily battles of the people who were caught in this strategic place of Nova Scotia. Even though, it was a sad time, she nicely blended a beautiful story of trust, hope and second chance! In 'Come from Away', we follow Grace and Rudi the stranger that mysteriously entered her life during a hall dance. We also meet her family and her three brothers, Eugene, Harry, Norman who have left for war. To keep busy and making sure that she is helping her community, Grace works at the general store. One morning, this stranger drops by the store. This moment will be magical for them! But can she trust him? Is he a spy? The enemy? Slowly with time, Rudi will gain her trust! However, if Grace discovers the truth, will she still love him? I found these two main characters so endearing! I recommend this author to everybody. It’s so emotional, that you might be on the verge of tears during some very touching moments and dramatic events. If you love historical romance of second chance set in Canada and set in that period of time 1939-45, then you will be fascinated by Grace's touching story. I received a free advance e-copy of this book from #NetGalley in exchange for an honest review. The very first thing I did after finishing this book was go online and order another book by this author. It was that good! I was initially drawn to the book by its cover and title as well as the fact that it was set in the time of WW2, an era that I am fascinated with. I think that the title Come From Away first captured my attention because of the wonderful Broadway Musical "Come From Away" which is s I received a free advance e-copy of this book from #NetGalley in exchange for an honest review. I think that the title Come From Away first captured my attention because of the wonderful Broadway Musical "Come From Away" which is set in Gander Newfoundland and details the warm hospitality shown by the people of Gander to those whose airplanes were stranded there on 9/11. I had not realized that the term was also used in other Maritime provinces but was ultimately not surprized. Some of the characters in this novel apparently feature in another book by this author which I have not read. While I would now be very interested in reading it, I didn't feel any lack for not having read it. The story is complete in and of itself. The tale is set in Nova Scotia in 1942. The heroine, Grace Baker still lives with her parents and does most of the running of the local store which serves to supply her community in a way that is really essential. Three of her brothers have been in active service since 1939 and as part of a close family, she misses them immensely and worries about them all the time. She wonders if she is being selfish by staying at home and whether she should be signing up for something more important in terms of war work.. Her father lost a leg in the last war and although he hasn't talked about it much, she wonders if it would please him if she had signed up too. No sooner does he reassure her than a telegram is delivered informing them that her brother Norman was at Dieppe and did not survive. The author has the ability to write in such a way that the words flow and they really made me feel as if I understood what the characters were thinking and feeling. The immensity of their loss affects everything and it is hard to pick up and keep going when war seems to be more and more a part of their world. Grace is filled with an incredible anger towards anyone or anything German and has trouble understanding why her parents don't share the deep anger that she is feeling. The author was initially inspired by stories that she heard from locals in her Nova Scotia home about the time when German submariners came ashore and joined in at a local dance which was being held. She used this inspiration in her book when Grace attends a local dance and catches the eye of a tall handsome and silent young man who invites her to dance but then disappears. He later reappears in her store claiming to be a fur-trapper of German extraction. The more she gets to know him, the more appealing he seems to her and the more important he is to her but eventually, after he saves a local boy from drowning when some ice breaks his secret gets out. Grace learns that he is one of the hated "Nazis" and even worse, he is staying at her home! This book is very relevant to what is happening in the world today. Just like Grace, many people struggle to see past a stereotypical anger they feel towards those who are different and who "Come from away". Over time as Grace gets to know Rudi and understand who he really is and how he was raised and came to be a German soldier, she is able to see past her hatred and fall in love with him. Not all around her are willing to look past his nationality though which leads to some very tense moments. This book captivated me to the point where I really couldn't put it down and read it in the space of 24 hours. There are so many important lessons to be learned from it. When some of Graces brothers return one gets to see and understand just what shell shock is and how the average soldiers who fight on opposite sides in wars are really not very different from each other. I received an eARC of this book from Net Galley in exchange for an honest review. I went into this book with high expectations - a historical fiction set in Canada during war time? That is basically one of my most favourite set ups. Come From Away did not disappoint. I enjoy historical fiction because I enjoy learning about the past AND a good story. The was definitely some history here I had never been aware of before, which is always fun. It felt very well researched, and the spirit of the Cana I received an eARC of this book from Net Galley in exchange for an honest review. I enjoy historical fiction because I enjoy learning about the past AND a good story. The was definitely some history here I had never been aware of before, which is always fun. It felt very well researched, and the spirit of the Canadian East Coast is well captured. The characters were interesting, and I felt Rudi especially was very well done. His broken English was believable and not over done. Being honest, this was pretty near a 5 star read for me for st least 75% of the book. The emotions Grace experiences feel real and I was always finding it hard to put the book down, wondering how things would turn out. The end, however, I found a bit weak. Linda kind of falls out of the picture for so long and then comes back in a huge way and it felt jarring. It didn't feel like I really knew her character and now she was having big emotional reactions that I objectively could appreciate but in the moment felt forced. There was also a bit of repetitiveness in Rudi's reactions to situations that started to get a bit stale, Grace's quick negative judgments also became a bit trite and not as compelling and at times Grace's family almost felt to perfect. Wow! What a wonderful book! This is my first book by Genevieve Graham, but it won't be my last! This is a beautiful love story between a young Canadian girl and an ex-Nazi. The characters are very well developed in the young girl's family. This book is refreshing because it's different than the typical WWII books I've read lately (there's a lot of them). I never for a moment got bored nor off track with this book. It's really a great read and I highly recommend it! I received an ARC of this book Wow! What a wonderful book! This is my first book by Genevieve Graham, but it won't be my last! This is a beautiful love story between a young Canadian girl and an ex-Nazi. The characters are very well developed in the young girl's family. This book is refreshing because it's different than the typical WWII books I've read lately (there's a lot of them). I never for a moment got bored nor off track with this book. It's really a great read and I highly recommend it! I just loved this book! It was an easy and lighthearted read, yet the author still did a great job of capturing the characters’ emotions and struggles. Just a note - it is NOT the same story as Come From Away, the popular musical. This novel's serious WW ll content was wrapped up in a beautiful love story. An easy, clean read. It would be the perfect companion on a beach vacation. 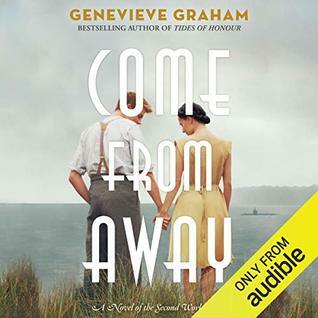 Genevieve Graham has been promoted to one of my new favourite authors through her brilliant WW2 novel Come From Away and her passion for breathing life back into Canadian history through historical fiction! I was pleased to discover Genevieve's previous book, Promises to Keep on the shelf of my local used bookstore. I had seen it advertised and it had been on my to-read shelf for a while, so I bought it and read it within a few days! It makes my heart very happy to see decent Canadian historical Genevieve Graham has been promoted to one of my new favourite authors through her brilliant WW2 novel Come From Away and her passion for breathing life back into Canadian history through historical fiction! I was pleased to discover Genevieve's previous book, Promises to Keep on the shelf of my local used bookstore. I had seen it advertised and it had been on my to-read shelf for a while, so I bought it and read it within a few days! It makes my heart very happy to see decent Canadian historical fiction making its way into the mainstream again, through authors like Graham. Come From Away is a beautiful love story between a wayfaring stranger, far from home, and a typical Canadian girl. Both Rudi and Grace were characterized really well. They were not static characters, one-sided, with one motivation or passion, but they were multi-faceted, well developed and empathetic figures. Graham also does a brilliant job of capturing facts about World War Two, both from the perspective of Eastern Canada and Germany in Come From Away. This is not just a story set in the 1940s, but a well-informed story that is dictated by the climate at that time. Furthermore, I was delighted to hear in Graham's Author Notes that she is planning on writing on a Mountie next, and then on the British Home Children. It just makes me so happy to have great new Canadian historical fiction to look forward to! Genevieve, thank you for telling Canada's story in such a skillful and beautiful way. Come From Away is nothing short of a masterpiece. Thank you for sharing it with us! 3.5 stars This Graham book had more sappy melodrama that sometimes repeated itself and was more than appeared in the first book of hers I read, Tides of Honour. However, I really do like her writing style and the characters she creates. This is the last book of the 4 I'm reading for Simon & Schuster Canada's Timeless Tour. I've got 4 minutes left on my audiobook, but I'm going to call this. Loved this!! What a surprise when the beloved characters from Tides of Honor appeared in the first chapter!! Ms Graham gets better with each novel and the research and character development in this were spectacular! Earlier in the year I enjoyed the audiobook Tides of Honour - a story about Danny and Audrey and WW1. When I started listening to this book Come From Away, I was delighted to find out that this one picks up the lives of their children and especially that of their daughter Grace. It's a complete stand alone, however, seeing how life has moved on pleased this reader! Grace works in a local store in Nova Scotia, while her three brothers are away at war - world war 2. Her parents Danny and Audrey are Earlier in the year I enjoyed the audiobook Tides of Honour - a story about Danny and Audrey and WW1. When I started listening to this book Come From Away, I was delighted to find out that this one picks up the lives of their children and especially that of their daughter Grace. It's a complete stand alone, however, seeing how life has moved on pleased this reader! Grace works in a local store in Nova Scotia, while her three brothers are away at war - world war 2. Her parents Danny and Audrey are there with her and also other various family members live by. One evening at a local dance some strangers come by, and Grace is attracted to one man who dances with her - then they are gone. Now off Nova Scotia there are German u-boats, so could these men have come from there?Some weeks later this stranger wanders into Grace's store - Rudi is his name. Supposedly a trapper but is he? 4.5 stars only due to the ending feeling a bit rushed but rounded up because of the incredible story. Historical Fiction … some history and some fiction. What fascinates me the most is how an author can use an actual historical event and create a story that is completely fascinating and makes me fully believe that this is what actually happened. In ‘Come from Away’, Ms. Graham takes events that happened in Nova Scotia during WWII and uses them as the backdrop for a story by simply asking “What if? 4.5 stars only due to the ending feeling a bit rushed but rounded up because of the incredible story. In ‘Come from Away’, Ms. Graham takes events that happened in Nova Scotia during WWII and uses them as the backdrop for a story by simply asking “What if?” We know German U-boats rained down terror during the war and numerous tragedies occurred as a result. We also know U-69 was sunk off the coast of Nova Scotia. What is also true is that a group of submariners came to shore and quite likely attended a local dance. Here is where the ‘what if’s’ begin and they create quite a tale. I was immediately pulled into the lives of Grace Baker and her close knit family & friends who were all just trying to survive the war as best they could. In trying to find the smallest bit of hope & joy during this time, Grace attends the local dance with her good friend. It’s at that dance where a chance encounter ends up changing Grace’s life. I won’t tell the rest as this book deserves to be read without any spoilers. Suffice it to say that there is drama yet a sense of peace, challenge yet optimism. The use of dual POV’s was perfect for this book. Both Grace’s & Rudi’s thoughts, emotions and experiences are vital to the flow of this story. I can’t really imagine the story with only one. There are so many events of WWII that aren’t widely known. The events that create the foundation of ‘Come from Away’ are one of those for me and I’m so glad this book gives it the opportunity to be told. Hopefully this book will create interest so that these stories aren’t lost to time. This is the first book of Ms. Graham’s that I’ve read and it definitely won’t be the last. What a sweet read.... I love the Baker family!!! Let’s sum it up!! Pretty much Canada is at war like the rest of the world fighting the Nazis. There is a sub that’s near Canada, and there some of the men came out for a huge dance, just to past the time. There one of the men meet a woman named Grace, he dances with her, she’s intrigued, they go their separate ways, and that’s it. Or so we think. Grace has 3 brothers and they are all soldiers fighting. One died and 2 are still fighting. And then a mi What a sweet read.... I love the Baker family!!! Anyway, the soldier of Graces dreams comes back into her life but this time she finds out his name and finds out he is the enemy but not really.... he’s a Nazi soldier but he’s a soldier non the less... he’s an amazing person and he way Her family the Bakers handles everything made this book even sweeter!!! I received and ARC from the publisher via Netgalley in exchange for an honest review. I was lucky enough to receive an ARC of the prequel of this book, Tides of Honour, which I really enjoyed so I was thrilled when I received an ARC of this. I really loved the Audrey and Danny in the first book and it was nice to see what happened in their lives since the explosion in Halifax. This book isn't about them though, it's about their family, mainly focusing on their daughter Grace and a German named Ru I received and ARC from the publisher via Netgalley in exchange for an honest review. I was lucky enough to receive an ARC of the prequel of this book, Tides of Honour, which I really enjoyed so I was thrilled when I received an ARC of this. I really loved the Audrey and Danny in the first book and it was nice to see what happened in their lives since the explosion in Halifax. This book isn't about them though, it's about their family, mainly focusing on their daughter Grace and a German named Rudi. This book takes place in Nova Scotia during the second world war. Grace stays at home to help her parents while her brothers go to war. On the flip side, Rudi is in the German Nazi navy aboard a U-boat. Fate has them come together to meet at a dance one night and the rest is history. This is a young woman’s chance encounter that set a series of events in motion that neither Grace Baker of Rudi Weiss was ever expecting. The setting takes us to a small town on the coast of Nova Scotia, and Graham describes it so beautifully for being during a ragin war going one. It was was be transported here, and found myself enthralled learning of this era of time, the town and the townspeople as well. Prejudices play a large role during this time, as we see those prejudices through both Gra This is a young woman’s chance encounter that set a series of events in motion that neither Grace Baker of Rudi Weiss was ever expecting. The setting takes us to a small town on the coast of Nova Scotia, and Graham describes it so beautifully for being during a ragin war going one. It was was be transported here, and found myself enthralled learning of this era of time, the town and the townspeople as well. Prejudices play a large role during this time, as we see those prejudices through both Grace and Rudi’s eyes as they tell us their story. They met at a local dance, not know each other’s name, they danced together, and had a connections that neither of them thought would go anywhere. Rudi was set to ship off on U-Boat he was assigned to. It wasn’t until later on that their paths crossed again. Rudi’s a German soldier, his U-Boat has sunk, killing majority of the crew but he survived somehow. He’s in a place now that he doesn’t know, he doesn’t speak clear English, and if anyone knew who he really was, they wouldn’t want him there. Running into Grace in the local goods store was just what he needed and wanted too. Grace is drawn to him, but she also has no clue who he is or where he is from, this was a problem. I found myself wanting Grace to see him for the good guy he truly was, but during this time, Germans were the enemy, and I wondered if she and her family would be able to get past it and help him. Finding out if Grace would give into her heart was something I wanted to know too. Rudi had good in him and sometimes following what all he went through even as a child, was so sad, but he had a great strength with him, of course he had to for everything that was thrown at him, it just made him more intriguing to me. Most of the events that transpired were caused by fear and prejudices and my heart broke for Rudi and Grace on so many occasions. As these two got know a little more about each other, the relationship grew, it was a slow burn but completely swoon worthy, and made me believe that there was still good in people even during this horrible time in history. Plus, I adored them together and I wanted happiness for both of them, together or not and for the Baker family. Come from Away was such a beautiful story of second chances, taking a stand and love. I can’t express enough how much I enjoyed this, it is one book that I would highly recommend reading, especially for fans of historical romances.